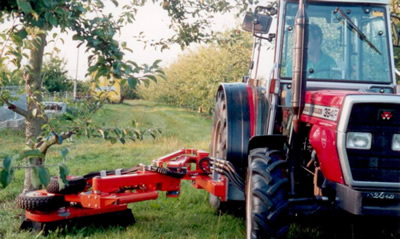 Tuthill Centipede side sweep is mid-mounted on the tractor and moves fruit from between the tree trunks and into the row ready for the harvester to collect. It is clears the fruit very efficiently from between the trees. The Centipede side sweep eliminates the need for a blower. It has two pneumatic tyres to guide itself round the trees. Adjustable height control wheels within the brush allow it to follow the ground contours precisely. 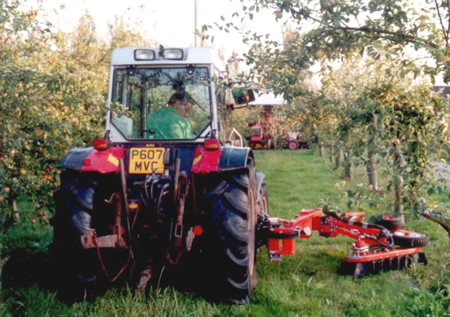 It works equally well when working on grass or in an orchard with herbicide strips. Adjustable compensating springs enable the machine to be set for particular ground conditions. 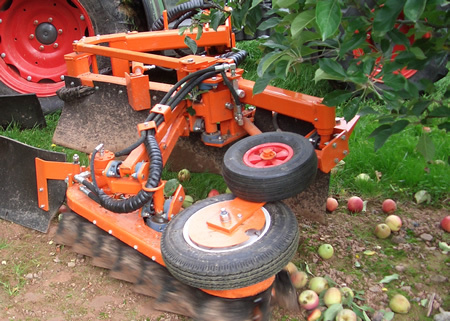 The machine can be hydraulically positioned to work in row widths from 4.25 (14 ft) metres to 6.00 metres (20 ft). When fully retracted the brush will fold up for transport.